Allianz is an international insurance carrier seeking to provide their German health insurance customers with the ability to take and submit photos of invoices for timely reimbursement. They had an existing, white-labeled app and wanted to replace it with features supporting a new service offering and design that illustrated their value to their customers. In Germany, the healthcare provider doesn't submit the bill to the carrier. Individuals with private health insurance first receive a bill and then submit it to their insurance carrier for reimbursement. Roles & responsibilities: led a 2-week research and design sprint to test two rounds of prototypes with remote users in German and English, designed prototypes, taught clients user research techniques, facilitated feature ideation and prioritization, designed icons and established visual design direction, and paired with developers on implementation. Finding users. Most Germans are insured by the state and those that are privately insured were difficult to locate. I worked with the client to interview friends and co-workers insured by Allianz or competitors. Privacy laws. Privacy laws in Germany around health care prevented us from interviewing Allianz's customers. Customers would have had to receive a notice in the mail and only if they mailed a response would we have been able to talk with them. This process would have taken 2-3 months. Observing app interactions in person was not possible. All interviews were remote and user base was unfamiliar with downloading Invision prototypes to their phones. We had users click through the prototypes on their desktops. Language barrier. I'm not fluent in German however our client team spoke English and German. I ended up designing the app in English first and then translated screens with the help of the client product manager. We worked with the client team to draft the persona of a frequent user of the app. Jürgen is a family man with a chronic health condition that requires regular hospital visits and therefore regular reimbursements. Jürgen wants to know when he'll get reimbursed and why he wasn't 100% reimbursed for the bill. We validated this persona in the initial weeks of the project. Taught client PM to ask open-ended questions during German interviews. I also had bilingual teammates listen in and probe on user feedback. We looked to understand their workflow for submitting invoices from their providers to Allianz. Coached client team to record insights during interviews. At the end of the interview round, we looked for trends across interviews. Led collaborative sketching sessions with product and engineering and then facilitated dot-voting sessions to identify useful UI elements and interactions. I worked to illustrate what our users shared with us, that they would spend a Saturday at the kitchen table taking pictures of all of their receipts. I also made sure to emphasize what users found valuable: speed of both submission and reimbursement. One cultural learning about working on an iOS app for the German market was that users enjoyed reading all of the content and made sure to point out any incorrect connotations. The final screens walk a user from onboarding, taking and editing a photo of a bill, and then managing their reimbursements. The main workflows were designed and implemented within 6 weeks of the project start date. 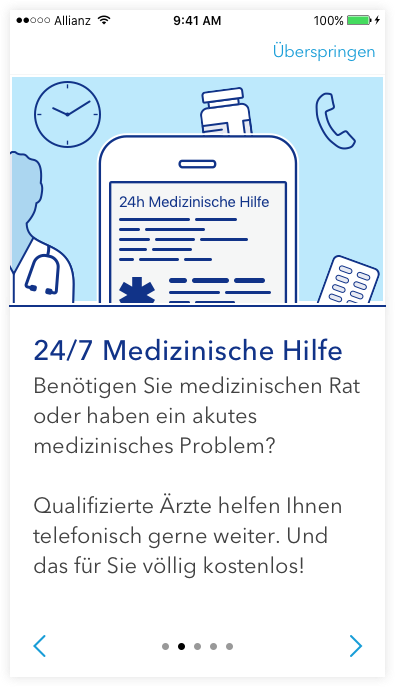 The CEO of Allianz Health was very excited by the redesign and eager to publicize the app.